Back in January, I posted an invitation to enter the PR Xchange Awards Competition. Over 390 entries in print and electronic formats were submitted from over 100 institutions, including public, academic, school, state and special libraries. Now, the 2017 winners have been announced. This year there are 28 electronic winners and 30 print winners. A complete listing is available at http://bit.ly/2017-PRXChange-Winners. Entries were appraised by a jury of 8 in-person judges and 15 virtual judges. Submissions were assessed based on the quality of content, format, design, creativity and originality. The jury, which included talented marketing and communications professionals, graphic designers, several outreach librarians, and a library marketing consultant, were impressed by the innovative and compelling work submitted by libraries. 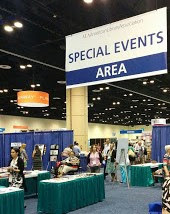 Winning entries will be on display at the PR XChange Event, which will take place on Sunday, June 25, from 11:30 a.m. – 1:00 p.m. in the ALA Exhibit Hall's Special Events Area, at the ALA Annual Conference in Chicago, Illinois. The PR XChange Event offers visitors the opportunity to view and take home sample promotional materials from libraries across North America. Approximately 1,000 attendees visit the PR XChange event each year. · 2017 John Cotton Dana Library Public Relations Award Winners will display their award winning materials. · The 2017 Library Marketing and Communications Conference (LMCC) Planning Committee will be here to answer questions about the upcoming 2017 Conference. · The ACRL Library Marketing and Outreach (LMaO) Interest Group will talk about their activities. · Kathy Dempsey (that's me!) will be giving away sample copies of Marketing Library Services newsletter, answering questions as the Libraries Are Essential marketing consultant, and selling copies of her book, The Accidental Library Marketer. · Rebecca Metzger (current PRMS Chair) and Holly Flynn (incoming PRMS Chair) will be answering questions about the Public Relations and Marketing Community of Practice of LLAMA. · Representatives of Rowman and Littlefield Publishers and ABC-CLIO will display and sell copies of recent library marketing books. So stop by on June 25 in Chicago! Chat with me at my table, see winning work on display, buy some new marketing books, and learn about PR efforts from around North America!